The North is a vast area, sparsely populated by people and navaids. As a result, there is not much of an airway system. While in recent years it has improved, it is still not capable of much more than taking us from one major community to another. This means that, in an area of widely scattered villages, cabins, and hunting/fishing/exploration camps, IFR flight is quite limited, and that VFR navigation is dependent not only on how well you know a given area, but also on the old-fashioned techniques of pilotage and dead reckoning. Chapter 14 (Silk Scarf) takes a look at the techniques used by bush pilots since the 1930s. They have a long and honorable history behind them and are still in wide use today. Chapter 15 (High Tech) takes a look at some of the new techniques based on modern Loran and Global Positioning System (GPS) technology. These new units, especially when interfaced with a Radio Magnetic Indicator (RMI), are the wave of the future. While many, if not most, bush pilots limit themselves to VFR operations -- shunning IFR as if it were the plague -- I use both techniques. It is my opinion that, where appropriate, use of instruments provides a pronounced safety edge. 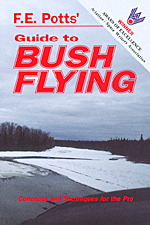 However, in this section I will focus mostly on VFR tips, the type of tips that are necessary for everyday bush flying. As for IFR tips, you will find them mentioned throughout this book wherever appropriate.